Food | What The BIEC? At our latest MIT (Madrichim in Training) training session, we spoke about the importance of “Tikun Olam,” which means to repair the world. The concept of tikun olam means helping others on every scale, from huge monetary donations to helping someone in need, hands-on. For me personally, I have always interpreted repairing the world as making small changes and helping people out in small ways, every single day. From picking up litter on the street to holding the door open for someone, there are so many ways you can make the world a better place on a day-by-day basis. It was out of this belief that “M.A.D. Mondays” was born. M.A.D. 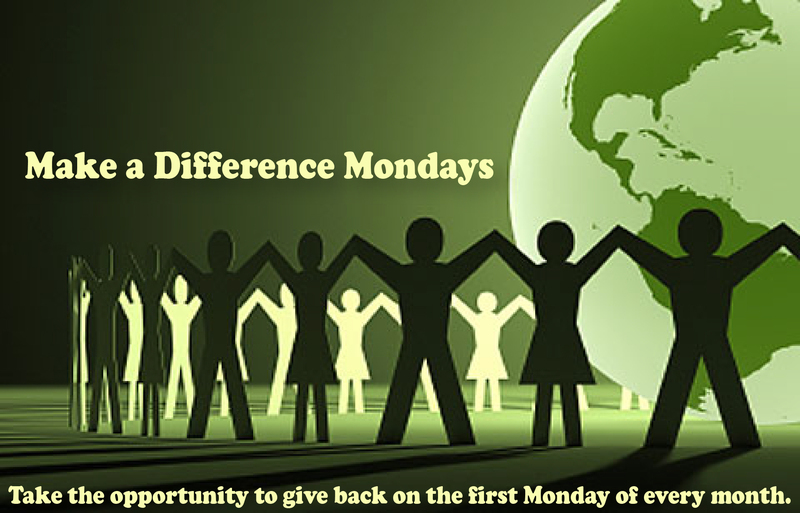 (Make a Difference) Mondays is a new initiative started by BIEC this fall. On the first Monday of every month (although time and date change often in order to fit in with busy schedules), a group of BIEC volunteers get together to give back to the community, helping out at different organizations throughout Montreal. The goal of M.A.D. 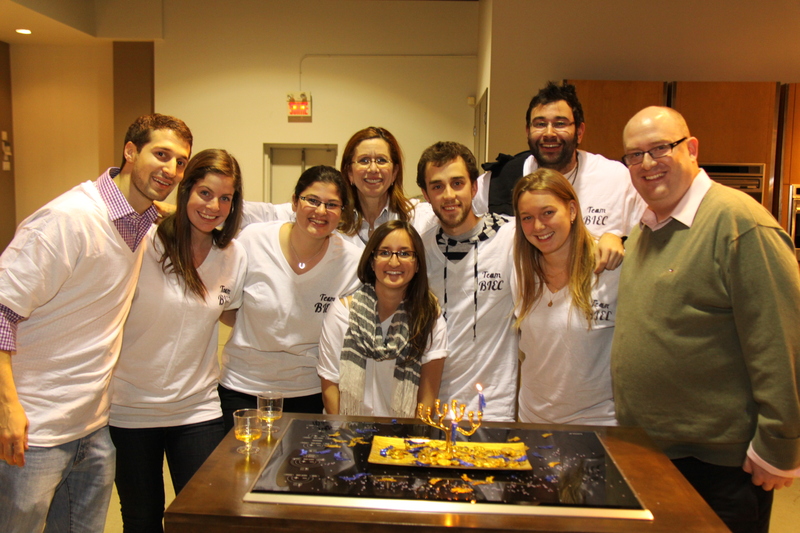 Mondays is two fold; participants are able to gain a greater knowledge and understanding of various organizations within the Montreal Jewish community, as well as devote a couple of hours each month to giving back to the community and helping those in need. This truly embodies the meaning of tikun olam. For November’s M.A.D. Monday project a group of 8 volunteers spent the afternoon at MADA Community Centre. For those of you who have yet to visit MADA, I highly recommend you take some time to do so. 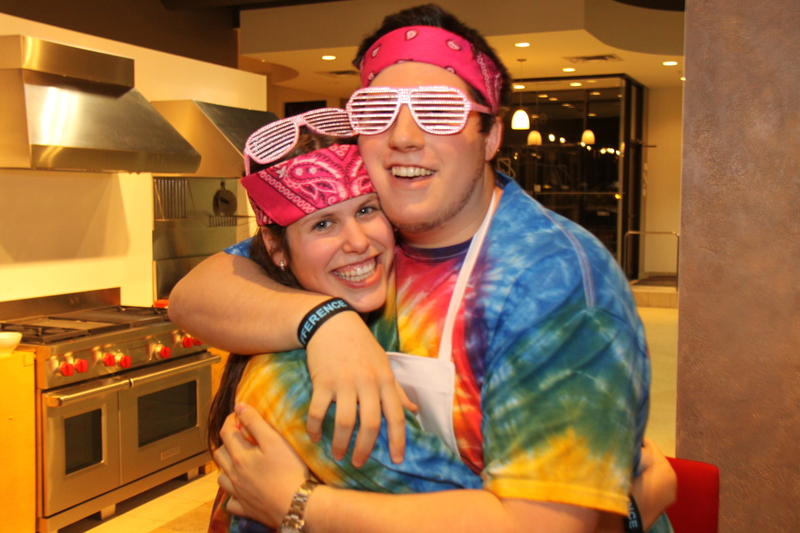 Not only will you meet amazing people, but MADA also gives volunteers a strong sense of how close knit and caring the Montreal Jewish community really is. MADA’s mission is to “help people in need with the basic necessities of life, while preserving their dignity and helping them become self sufficient members of the community.” They do so in many different ways, including serving free meals in their cafeteria, helping provide warm clothes to those in need, welcoming people in for holiday meals, and their Shabbat to Share program, which delivers pre-packaged “Shabbat boxes” to those unable to prepare for Shabbat on their own. Spending time with other volunteers or anyone who has benefited from MADA’s services, you are able to witness first hand the effect that this organization has on those who are involved. Pride, gratefulness, joy and generosity are just some of the traits that everyone is eager to share with those who are volunteering or visiting MADA for the first time. MADA truly appreciates and is thankful for all the work that their devoted volunteers do, from large scale to small. A great example of this happened during our afternoon working with them. Our group, initially set to help pack Shabbat boxes with the Shabbat to Share program, was told upon arrival that we would instead be helping out in the kitchen. Unsure of what this meant, we were set up at a long table with plastic gloves, cutting boards, knives…and huge containers of garlic! Although peeling garlic may not seem as though it makes as much of an impact as packing Shabbat boxes, we were quickly proven wrong. When one of the MADA employees came to speak to us about the organization, she made sure to mention that we had one of the most important jobs at the centre. Why, you might ask? “Without garlic, the food we serve in our cafeteria would be bland and tasteless. The people who come to MADA don’t only need food…they need a little spice in their lives. By peeling this garlic, you are bringing that spice!” With these words we were not only motivated to peel our garlic in double-time; we were inspired to hear that every single action done inside the walls of the MADA Community Centre really does help repair the world. M.A.D. Mondays will be volunteering with a different community organization each month. In December, we will be collaborating with the Friendship Circle for “Sufganiyot for the Soul,” making sufganiyot to share with the community. If you wish to get involved in this, or any other M.A.D. Monday projects, or for more information, please contact Shoshi Rothschild at shoshi.rothschild@bjec.org. Here’s your chance to make a difference in your community, so don’t miss out! It’s that time of year again; the time when you eat so much food that you ask to be rolled out of the dining room, the time you go home after dinner and put on your favourite sweat/stretchy pants, the time you sit around a larger than life table with your family and loved ones. You guessed it – Rosh Hashanah! In the last year, I’ve really taken to the kitchen. 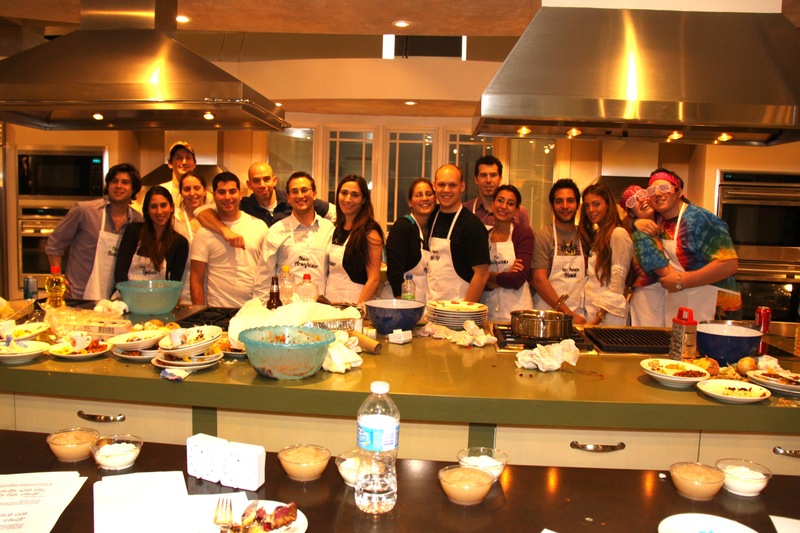 Cooking Shabbat meals for friends and family, daily dinners, and weekly Sunday brunches! So far, the general consensus is that I can, in fact, cook, and no one has gone home sick! In familiarizing myself with the kitchen, I wanted to share with you some of my personal High Holiday speciality meals. The following are some staple recipes at our holiday dinner table, brisket and apple cake! Appetizers can be anything your heart desires, ranging from gefilte fish, chopped liver, a nice salad and even matzo ball soup! All of which we make from scratch – yes, even the gefilte fish. So if you want or need a recipe for any of the above mentioned appetizers, hit me up with an email at amanda.noodelman@bjec.org and I’ll send them your way! So, keep reading to see how surprisingly easy it can be to make the most delectable holiday meal for your family! 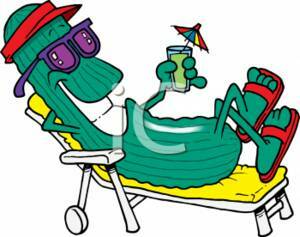 I know that it may not quite seem like it yet, but despite the weather outside, it is officially summer in Montreal! And, according to yours truly, the best thing about summer in Montreal (or any season in Montreal, for that matter) are the festivals! Just for Laughs, the Fringe Festival, Beerfest, and the Jazz Festival are just a few of the many weekends to look forward to this summer. Whether you like live music, delicious food and drink, or stand-up comedy, this city really does have something for everyone. I love Shabbat. Anyone who has ever seen me sit through a Shabbat meal can tell you that my eyes almost always well up with tears (of happiness, of course) when seated around a table amongst my family or friends. Whether I’m celebrating Shabbat at camp with 300 other people, sitting around my aunt’s beautiful Shabbat table with my cousins, or eating off paper plates on the floor of my apartment, there is almost nothing I love more than taking an entire evening to celebrate the end of the work week with good food, good wine, and good company. Shabbat at camp...the dining hall filled with lots of people and lots of singing! 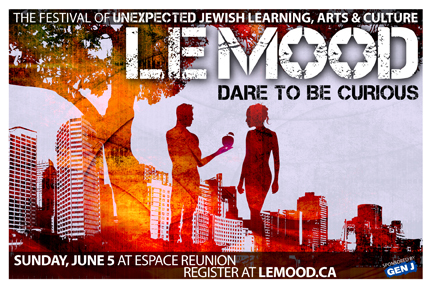 Up until I moved to Montreal, Shabbat was a holiday celebrated only when visiting my aunt, uncle and cousins in Toronto, or while I was up at camp. Once I moved out on my own, however, I began to feel the importance of celebrating Shabbat with the people around me, in order to start building my own traditions in a new city that I now call my home. Are you “Chai” on Israel? Ever get a card on a simcha (a happy occasion like Bar/Bat Mitzvah or wedding) with a check in it for say, 144$ (a multiple of 18)? Or ever plant a tree with JNF for 18$? As Passover is right around the corner, did you know 18 minutes is the maximum time matzah is to be cooked until it becomes unkosher? Without too much detail, once the dough hits 18 minutes, it begins to rise. 18 is also the date in the Hebrew month of Iyar when Lag B’omer occurs. We get this number 18 from the numerical value of the Hebrew word for life, “חי” or “Chai.” The ח or “chet” is the 8th letter in the Hebrew alphabet and is worth 8 and the “י” or “yud” is the 10th letter and is worth 10, hence the connection between Judaism, life and the number 18. I have been thinking a lot about Shabbat lately, and the idea of devoting one day a week to the idea of “rest,” whatever that may mean to you. While working on an upcoming project (stay tuned for more info on Shabbat 180), I found myself doing a lot of research surrounding the idea of “menucha.” In the biblical story of creation, God took six days to create the world and on the seventh day, He rested. On this seventh day, God created “menucha,” which means stillness and peace, in Hebrew. Shabbat, therefore, is meant to be a time of stillness and peace. No matter what religion you practice, after a busy week of work, school, running around, sitting in traffic, we all need one day to unwind and relax. What we do to relax ourselves varies from person to person, but one thing that we all have in common is that everyone can appreciate a full day of rest. 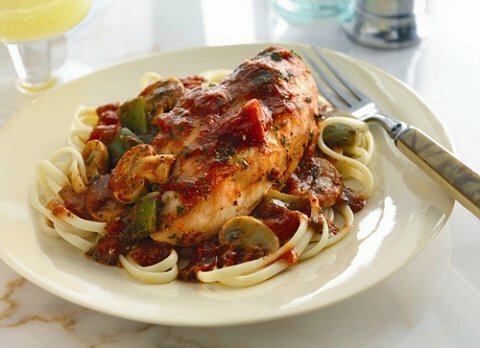 Chicken Cacciatore…the new Shabbat tradition! I have never thought of myself as an expert chef, let alone, a chef at all. So far, I’ve mastered making a killer breakfast sandwich, a great salad, and one or two hot dishes. So where does this leave our Shabbat dinner? Well, I’ll give you an inside look at what I’ve been serving! As these dishes are super simple and almost fool-proof, maybe the recipes we post can help you in creating your own Shabbat dinner, which can be much easier than you think! Sure it isn’t gefilte fish and matzo ball soup, but it’s what’s for dinner this Friday! And although the recipe is not extravagant, it’s actually my own and my friends and family can testify that this simple and easy dish is fantastic, and makes for the best leftovers! 1 can of potatoes, cut in halves. As much garlic as you want! Preheat oven to 375 degrees Fahrenheit, convection bake. Layer the ingredients in a large Pyrex starting with diced tomatoes, tomato sauce, chicken, mushrooms and peppers, some pieces of potato, onion and garlic. Keep layering until you’ve used all of your ingredients! Bake in the oven for 45 minutes. Serve! This is best served with white or basmati rice, or noodles! A great tip is to prepare this dish in advance so that the chicken can absorb all the flavours from the tomatoes and spices. You can add any other flavours you like to this dish! Some hot sauce maybe? Let me know what you think, and what you would add to make it even better! There are few things you can do in order to make winter bearable when you live in a city whose average temperature in January lands at –15 degrees Celcius. Taking up snowboarding or popping some vitamin D pills and hiding at home, waiting for the worst to be over may seem like your only options, now that the excitement of the first snow fall has worn off, and the warmth of the holidays are behind you. Well, good news for all you winter grinches out there; turns out, Montreal in the winter really isn’t so bad. Over the past few years I have come to realize that, despite Montreal’s infamous winter weather, this city breaks through all winter hibernation stereotypes and manages to come alive during the darkest months. Festivals, music and warm, delicious snacks are just a few of the reasons why I love Montreal…even when it is 30 degrees below. Igloofest is definitely one of the greatest things about winter in Montreal. For those who have heard about or experienced an afternoon at Piknic Electronik, think of this as the winterized version. For three weekends in January, Montreal’s Old Port is transformed into the setting for what can best be described as a giant, outdoor dance party. Igloofest features some of the best artists of the electronic music scene, light shows, outdoor bars and a hilarious ski suit competition! It runs from January 13-15, 20-22 and 27-29 from 6:30pm-midnight and is definitely worth facing the cold for. In minus 30 degree weather, sometimes you’ve got to dance to stay warm. And on the topic of crazy, winter, night time adventures in the city…Montreal’s High Lights Festival, more commonly known as Nuit Blanche is an annual all-night, city-wide festival that celebrates the culture, music, art and creativity of Montreal’s best and is, by far, one of my favourite nights of the year. The STM offers free bus routes to take you all around the city, from the Mile End to the Old Port, where most of Montreal’s galleries, museums and cultural centres stay open all night and feature over 175 (mostly free) activities. 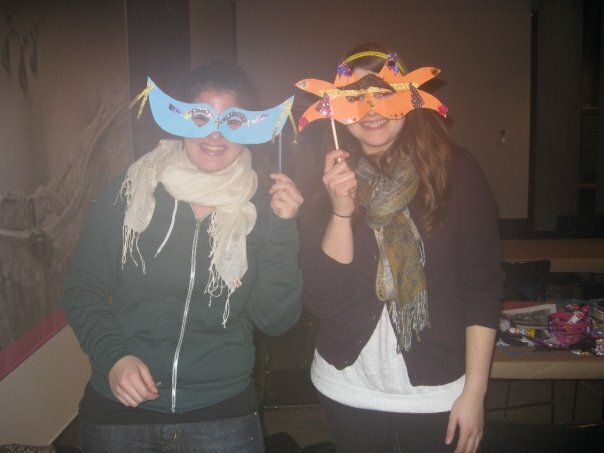 In the past, I have spent the better parts of my Nuit Blanche nights making masks for the masquerade ball at the McCord Museum, sliding down the massive ice slide that runs through Old Montreal, listening to gospel choirs at Notre Dame Basilica and roasting marshmallows over a bonfire outside the Science Centre. The greatest thing about Nuit Blanche? It truly caters to people of all ages. From loud, drunken university students to adorable children in snowsuits, there really is something for everyone, right up until its time to head to Beauty’s for breakfast. This year, Montreal’s Nuit Blanche starts at 8:00pm on February 26th with activities running well into the morning hours. Recommended: really, really warm socks. This really wouldn’t be an adequate review of winter in Montreal without a shout out to the ultimate winter treat; hot chocolate. For those of you who have yet to experience it, you need to check out Juliette & Chocolat (on Laurier at Parc, St. Denis at Ontario or St. Laurent at Prince Arthur) for the best hot chocolate in the city, according to yours truly. A far cry from the usual “just add water” instant hot chocolate, Juliette et Chocolat’s hot chocolate (which comes in extra-bitter dark, dark, milk, or white chocolate) comes closer to warm chocolate pudding than a liquid drink. 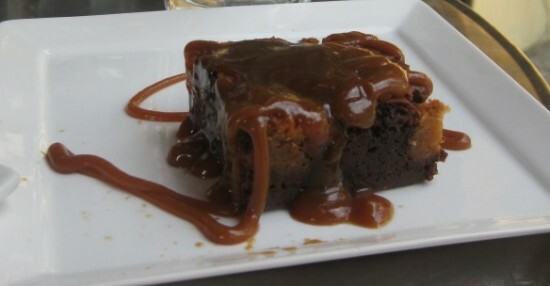 And while you’re there, you should probably also try one of their delicious, warm, freshly made brownies…the fleur de sel (chocolate brownie with salted caramel sauce) and the ivory (white chocolate and coconut) are two of my all-time favourites. All these years, summers in Montreal have been getting the glory while Montreal winters have been the unfortunate target of harsh hatred from the people who call it home. 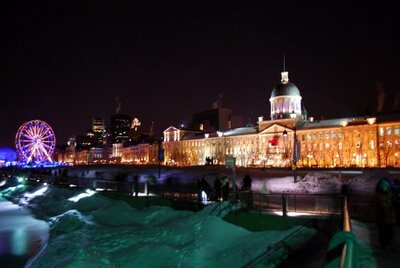 So this winter, give the city a chance and check out some of the amazing night life, food and culture that Montreal has to offer. And if there’s anything I’ve missed, feel free to post it below; I’d love to hear about your favourite winter-in-Montreal traditions! Bet you never thought that poutine could be considered a Chanukah treat, right? 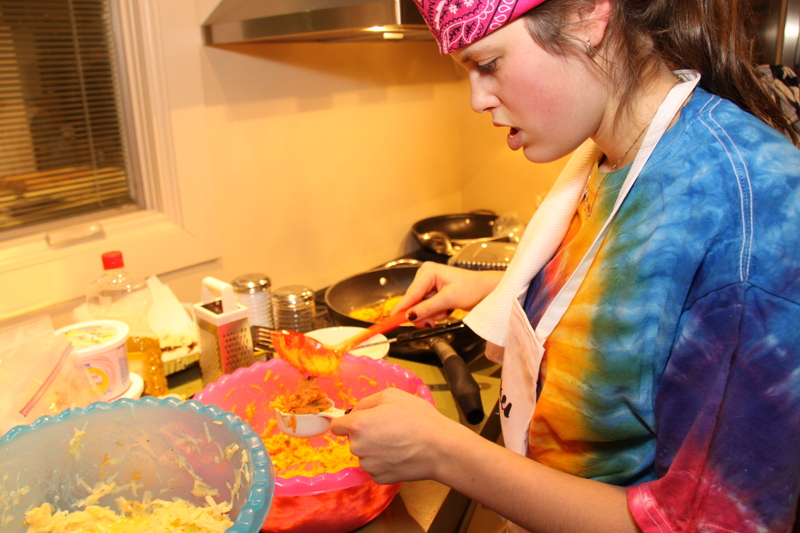 Well last night, at the first event of Team BIEC’s Eight Crazy Nights, Iron Chef: Latke, the winning team proved otherwise! 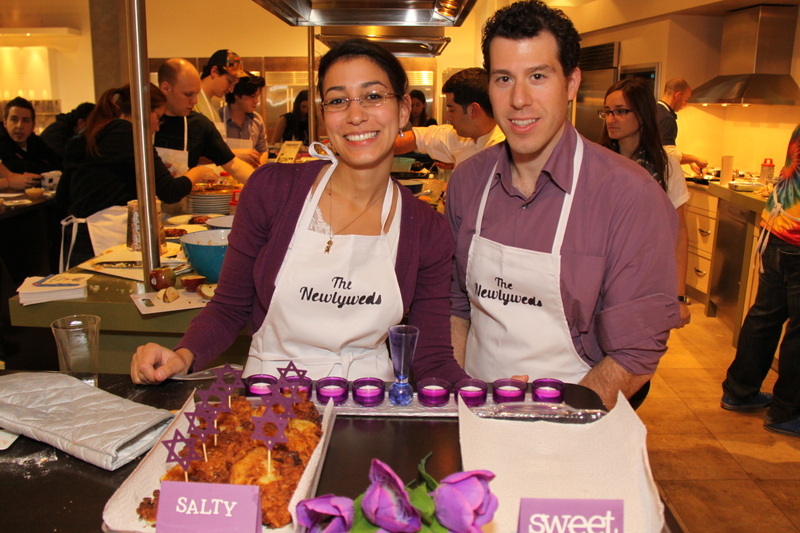 The evening was a huge success with 8 teams, each consisting of two people, battling it out for the title of Montreal’s top latke makers. 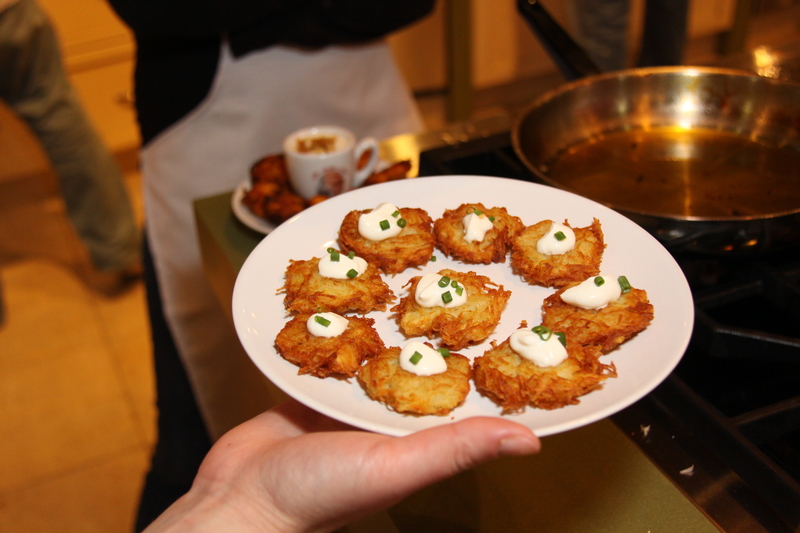 Taste, creativity and presentation all came into play in the battle for the best latkes and, as one of the 9 judges, I can honestly say that I was blown away by the amazing ways that these 16 chefs put their latkes together. From gingerbread to zucchini, goat cheese and basil to caramelized peppers, the evening knocked traditional latkes out the window and made way for new, modernized recipes. 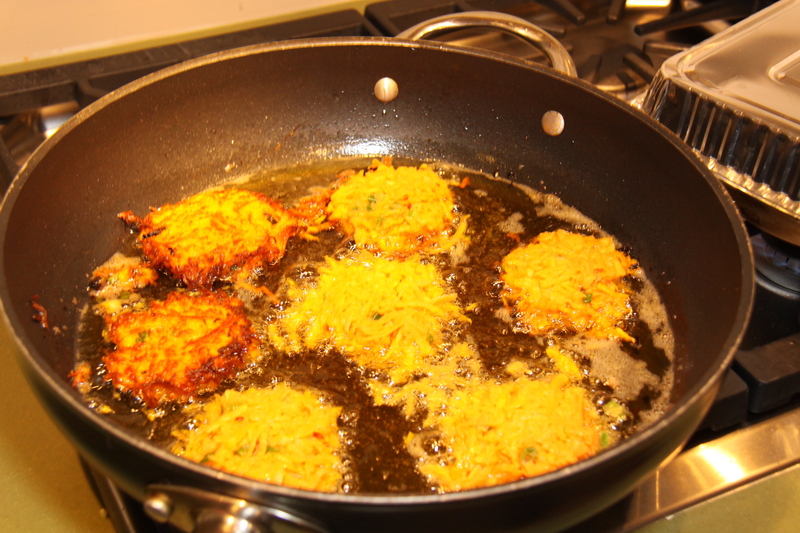 The winning latke? 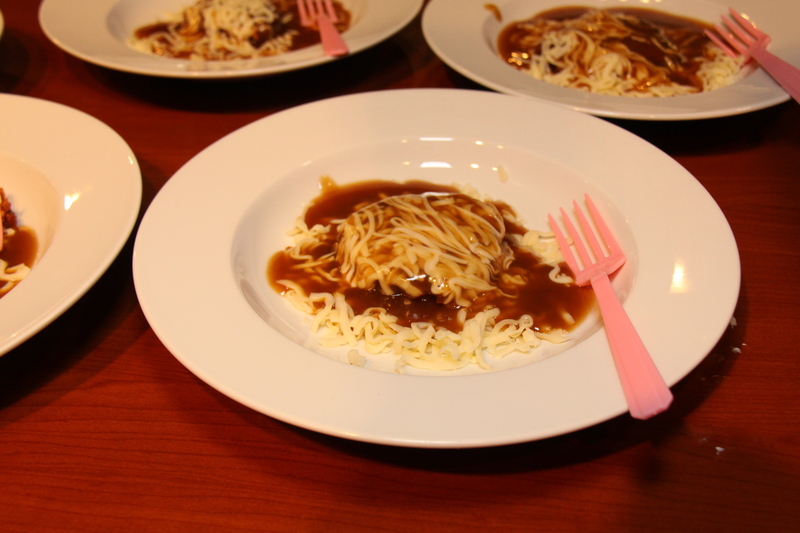 A traditional style potato pancake covered in shredded cheese and gravy…latkes Quebecois style! Stay tuned for the winning recipe, which will be posted online soon. 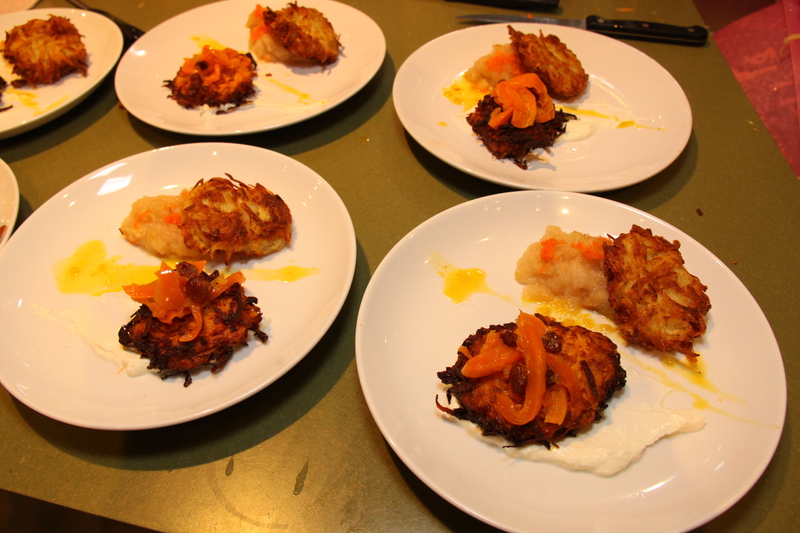 For now, enjoy some photos from last night, and feel free to share your favourite latke recipes below! 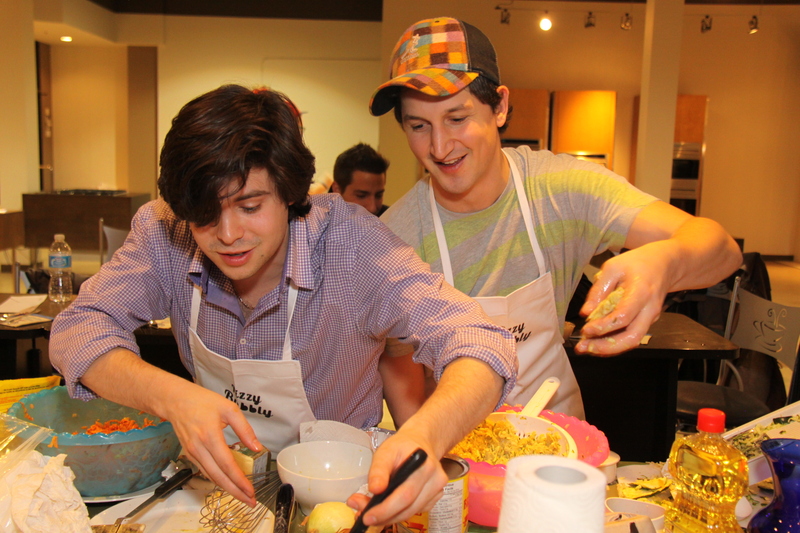 Team Pink - latke poutine! Second place goes to Team Yellow - Mr. and Mrs. Potato Head! 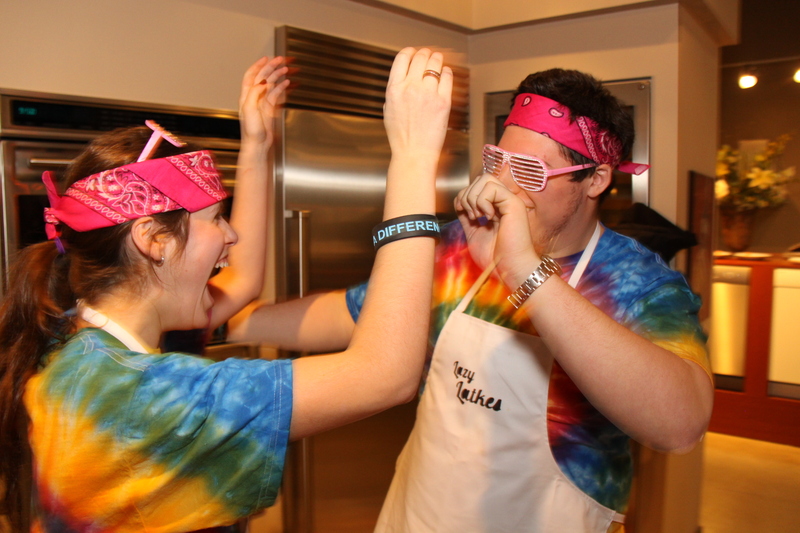 and the winner is....The Pink Team - The Lazy Latkes!